Having this weekend off was great for spending a very long day carving. I carved my first t-shirt block, a wolf. I tested the block out on two of my own shirts and they printed great! I placed an order with a t-shirt supplier for women’s 100% preshrunk ringspun cotton, tri-blend crew neck short sleeves shirts in four different colors. They will be here on Friday for this weeks printing. 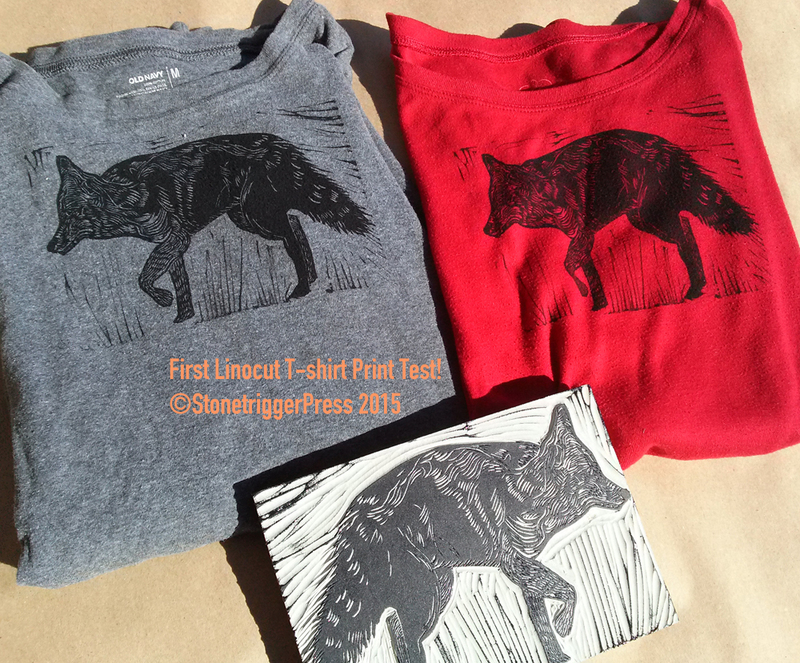 I will send out a few free samples to get your opinion on the feel of the shirt, the washability of the print. Last summer I printed a shirt last in the same manner and it is just as strong now was it was then, and it stays soft. I am planning on having shirts available in in two weeks, with at least two different images. I will also take orders for different color shirts, short or long sleeve, men’s or women’s cut. I also got a suggestion for a summer dress. There are just so many options. This is a fun learning process getting this all down. In the meantime I am finishing up carving today’s print. It will be out at 8pm EST. Your print looks great on the t-shirts. Hi there! What brand of ink do you use for your t-shirt prints? I use the same oil based ink I use when printing on paper; a mix of speedball and graphic chemical.